Compatible with iOS 8, 9, 10 and 11, and Mi Band 2. MiNotifier2 is a tweak that enhances the functionality of Mi Band 2 smart bracelet. - Configurable Heart Rate (HR) measurements: Single/Periodic/Continuous. Periodic mode is useful for daily tracking of your HR. The interval is configurable. Continuous mode measures your HR up to 30 per minute and it's useful for sport activities. - Two connection modes: On Demand/Always. 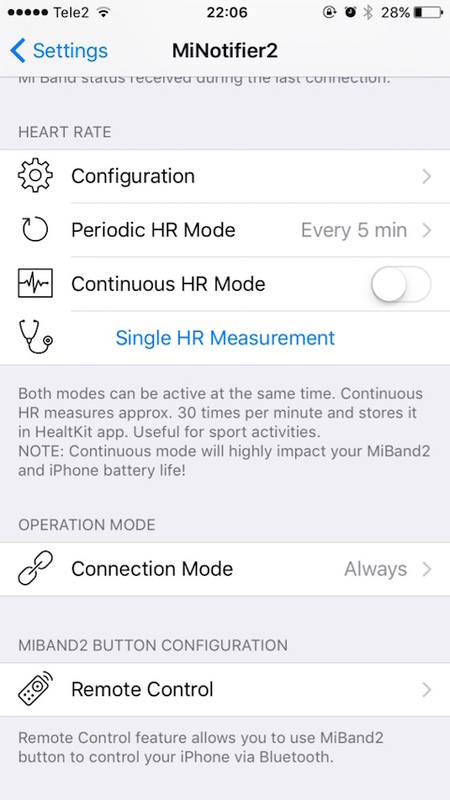 "On demand" mode will establish connection towards the band only when it is required (notification received/periodic HR measurement). Connected mode will keep the Bluetooth connection constantly active. This mode removes notification delays and enables full potential of "Remote Control" functionality. Note that this mode results in higher battery usage. 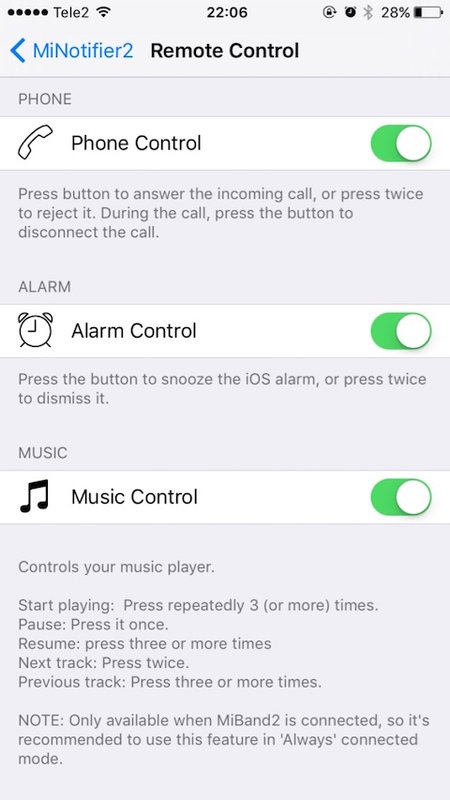 - "Remote Control" feature allows you to remotely control your iPhone. 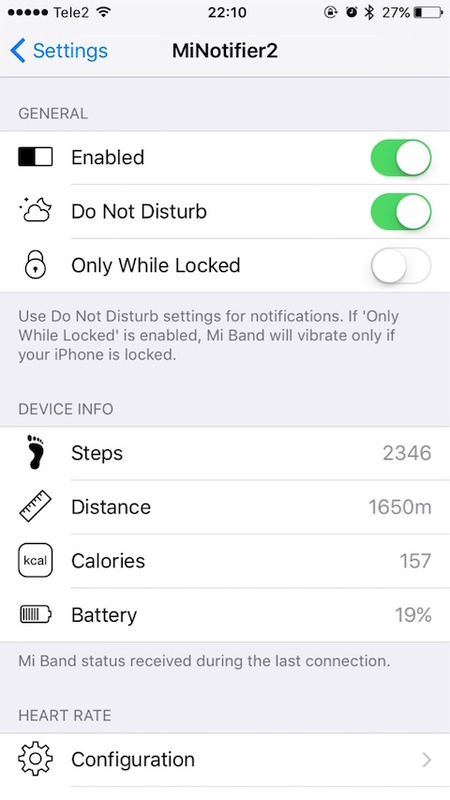 With the button on your Mi Band 2 you can answer/reject/hang up a phone call, snooze/dismiss iOS alarm, control your music player (play/skip track/previous track). - Configurable notification icons: You can customize notification icon on your band for each application. You can choose among 15 predefined icons. 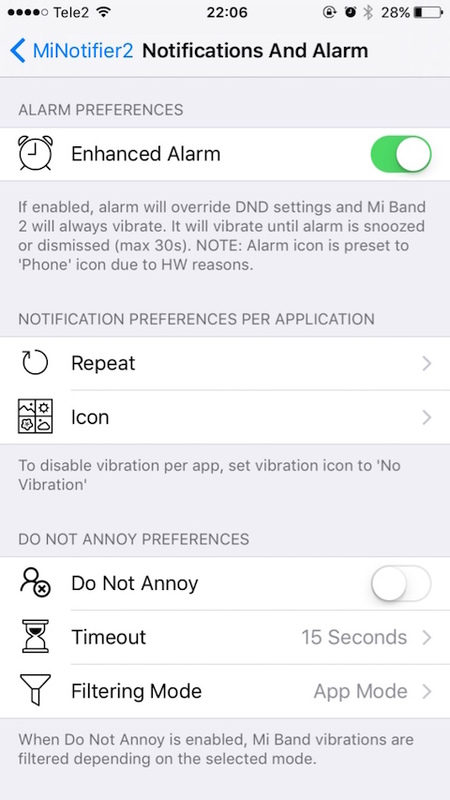 - "Do Not Annoy" mode that will make your band vibrate only for the first received notification within selected time period. While the timer is active, no notifications will be forwarded to Mi Band 2. There are two "Do Not Annoy" modes. First mode (App mode) filters notifications within a specific app. Second mode (App & Sender mode) filters notifications per notification sender for a certain app. It's useful for chat applications like WhatsApp, Viber, Messenger … This way only continuous messages from the same sender will be filtered out during the selected timeout period. - “Move Reminder” feature will warn you to take a walk if it detects you have been inactive for the configured time period.